The International Sustainable Electronics Competition is one which urges the industrialized world to move towards more green initiatives and develop a more sustainable system for the development, use and management of electronic devices. Katie Kinley entered this competition as a senior at the University of Illinois at Urbana-Champaign. After talking a friend whose job was to change the batteries for microphone packs in a large campus lecture hall, Katie came up with the idea of a Microphone Inductive Charger. Although her idea did not place in the competition, the Illinois Sustainable Technology Center worked with her to present her idea to our UI Sustainable Electronics Campus Consortium, to see if instructional technology groups on campus might be interested in exploring her concept to reduce battery waste, labor, and associated costs. Representatives of the CITES instructional technologies group were intrigued, and worked with Katie to create a prototype of a 3D printed adapter for the microphone packs they use, which would allow for the inductive charging of rechargeable batteries for the packs. Watch a video of her explaining the concept over here. Katie graduated, and although she was unsuccessful in identifying students to continue her work, CITES was interested in perhaps pursuing a pilot of the technology on their own. 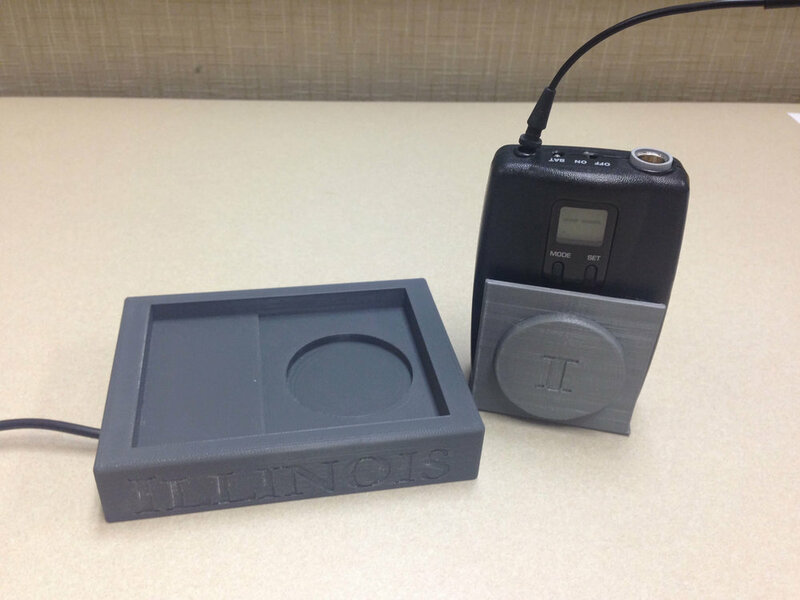 The reprint created at the Illinois MakerLab was to correct a slight flaw in the design, which was keeping the rechargeable battery from seating properly in the microphone pack. As students, we should be inspired by Katie and work towards thinking out of the box. We do not have the design and manufacturing limitations that earlier generations may have encountered. By expanding our imagination we can achieve innovations that could revolutionize industries. At the MakerLab we are working constantly we students and faculty members to do just this. Don’t pass on this opportunity, contact us at uimakerlab@illinois.edu or come visit us at 515 E. Gregory Drive, BIF #3030, Champaign, Illinois 61820. Read more stories about Makers like Katie. Like us on Facebook, follow us on Twitter and on Google Plus to be the first to hear about other workshops, meetups and deals at the MakerLab.